A recipe clip showing you how to make Kimchi. Kimchi can be eaten on its own. It is also a condiment or side dish and amongst other things, it’s usually served with Bulgogi, a Korean marinated beef dish. Another example dish that people love is the Kimchi Fried Rice. Many Koreans include Kimchi in their meals almost everyday. 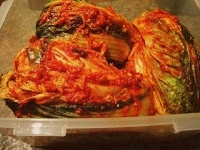 There are many variations of Kimchi and ingredients used depending on the regions. Visit the full Kimchi recipe here.